This is the third in a series of guides I have written for myself in an attempt to make sense of DBMM. It's a flow chart showing how to start a game highlighting where to remember things for later on. It focuses on who does what and in what order. It's available as a free pdf download. 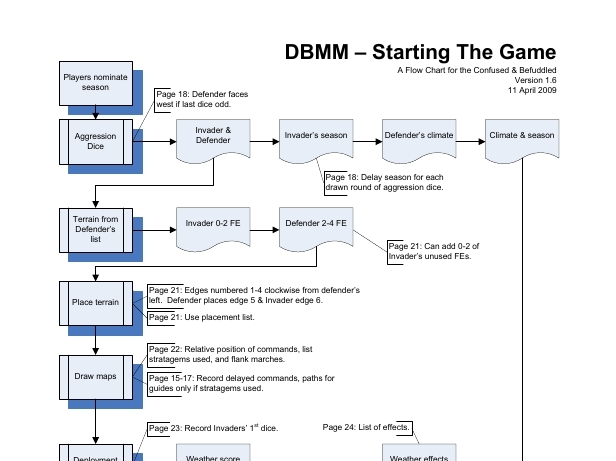 My first games of DBMM were in early September last year and I have been struggling with the transition from DBM ever since. I expected to switch easily because I regularly switched between DBM 3.1 and DBR 2.0 without too much difficulty. I couldn't have been more wrong. In fairness to DBMM, some of my initial problems were caused by work which prevented me playing regularly. Even so the complex, and in my opinion often convoluted, flows in DBMM have made learning the game much harder than I expected. Updated: Tue, 03 Jun 2008. I tried this - didn’t work for me but then I’m befuddled. Updated: Thu, 05 Jun 2008. Version 1.3 now available. Thanks to John Garvey of Australia for spotting a small error with the weather score. Thanks also to Bill Armintrout of TMP who raised the profile of this guide by posting this high profile news article. Worth a visit for the discussion. Updated: Fri, 08 Aug 2008. Version 1.4 now available. Thanks to Rob Brennan for suggesting an addition regarding unused Invader’s FEs. Updated: Mon, 17 Nov 2008. Version 1.5 now available. Thanks to Marcel Bos for pointing out that the recording of ambushes was in the wrong place. Updated: Sat, 11 Apr 2009. Version 1.6 now available. I’ve added a couple of notes to make clear who usually deploys and moves first (usually the Defender). As one about to set my toe forth into the ocean that is dbmm I thank you for the interesting and helpful downloads! Phil Barker, 03 Jun 2008"
"The attacking party shall be designated as the party of the first part except when the second party (the party of the second part) becomes the party of the first part in lieu of the original party of the first part under the general circumstances (not to be confused with the general principles, or general electric who is a purveyor of electrical goods, not to be confused with the conveyor of the goods which is a belted drive mechanism (+2 for uphill, +1 for electrical power, void where prohibited by law some assembly required, batteries not included) which shall move the electrical goods forward at a standard rate unless in rough going or out of the command radius of the party of the second part (formerly known as the party of the first part) or when uphill or charging pike armed heavy infantry (+1 for each additional rank, +1 if supported by skirmishers) in which case the general prudential rule (not to be confused with the rule of General Prudential of the Fatimid (See book III a army 47, with all options) in which case the earlier definitions of the parties of all respective parts are restored by a 1 rolled on an average D6." Yes, before all of you purists get a knot in your knickers, I KNOW Mr. Barker's english usage is technically correct, but especially for a newcomer to wargaming, picking up one of the DB? rules books and trying to make heads or tails of it without a mentor is at best a daunting task, and in many cases overwhelming enough to say "Heck with this" and find a rule set that is less arcanely worded, cross-referenced, with illustrations and examples. If you could put the deployment map from one of your previous downloads, with this flow-chart, it would be a great "start of game" resource.